Register now to become a VIP Client and earn TanYa Points!! TanYa Points earn you a 4% DISCOUNT against future sunless solution orders! To qualify for TanYa Points please click on 'Registration' and fully complete the form. Once we send you a confirmation email, you can start earning TanYa Points on your spray tanning orders placed on our online shop with a value of over $100. TanYa Points only apply to Solution and Retails Product orders placed on the Spraytanz website. You can earn Tanya Points on your first order which you can them redeem against your next order. TanYa points can be accumulated until you choose to redeem them. Each time you place an order you will be notified of how many TanYA Points you are earning. When redeemed TanYa points are applied as a discount against an order. TanYa Points only apply to the amount of the order and are exclusive of Freight and GST. Once you have placed an online order you will be given the option to redeem your earned TanYa Points against that order, or leave them to increase in value. TanYa Points are 'owned' by the client who has been approved and can't be transferred. If you sell your 'business' you'll need to notify Spraytanz of any changes. Don't forget to 'LIKE' us on Facebook! You will be able to earn extra TanYA Points on our special offers! GREAT AS A COMPETITION TAN ALSO! ERYTHRULOSE derived from Raspberries that works with the DHA to provide an all over even, streak free tan, its slower to develop than the DHA so makes the Tan last longer! 100% NEW ZEALAND MADE for more than 9 Years by the ONLY Organically Certified, ISO Approved, Cosmetic Manufacturer located on Auckland's North Shore. Spraytanz have been the Brand Leader in the NZ Spray Tanning Industry for more than 9 Years now. 118 TanYa Reward Points are available for this product! 100% Made In New Zealand by the ONLY Organically Certified, ISO Approved, Cosmetic Manufacturer, located on Auckland's North Shore. Spraytanz Ltd is New Zealand’s leading brand and was first established more than 9 years ago. (118) TanYa Reward Points are available on this purchase for all VIP Members! Wondering what makes Spraytanz stand out from the rest of the crowd? What we're most proud of is that ALL our absolutely stunning, natural solutions are 100% New Zealand Made by ONLY Organically Certified, ISO Approved, Cosmetic Manufacturer located on Auckland's North Shore. Thousands of people have been sprayed with our Organically based sunless solution and loved it! Don't just take our word for it, click HERE to read some of our fabulous feedback. COCO 12 - Contains 12% ECO CERT ORGANIC DHA - The Magic that makes the Tan Happen!! This is a Spray Tan Solution for Skin TYpes 4/5: is ideal as Competition tan, and can also be used as a 2-4hr Tan. It's crazy dark and designed primarily for competition tans, body building, professional dancing etc. Those of you who have been with us long enough will know we used to do a COCO 12 in the early days before we knew exactly what gave tans that orange glow. Now we know that it's *TOO MUCH DHA ON THE WRONG SKIN TYPE* .. so be careful out there!! . And please NOTE COCO 12 not suitable for Skin Types 1/2 unless washed off within two hours. However, Skin types 4/5/6 will absolutely love it! 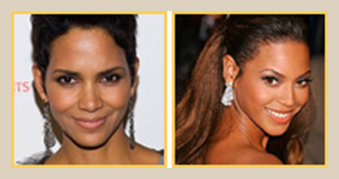 See Halle Barry and Beyonce below, both fairly typical examples of Skin Type 5/6. Spraytanz solutions contain only the purest and essential ingredients available together with the highest grade ECO Cert Organic DHA!! Your key to an absolutely stunning tan our tanning solutions promote the same warm, golden tones of a natural tan.Your clients will love them! 100% ECO CERT ORGANIC Dihydroxyacetone (DHA), a naturally occurring substance that is now the most popular and healthiest way to achieve a sunless tan. ERYTHRULOSE derived from raspberries and works synergistically with DHA to provide an all over even, streak free tan; it's slower to develop than DHA so makes the tan last longer! ALOE VERA and a MultiVitamin Complex to hydrate and nourish the skin. Our unique BRONZER which gives that instant 'WOW' gratification. All our COCOTanz solutions have a pleasant, tropical fragrance and as dermatologists say, 'it's as safe as applying make-up'. An added benefit is that Spraytanz Tanning Solutions are touch-dry in an instant, great for speedy client turnaround. Copyright ©2019 Spraytanz. All rights reserved.